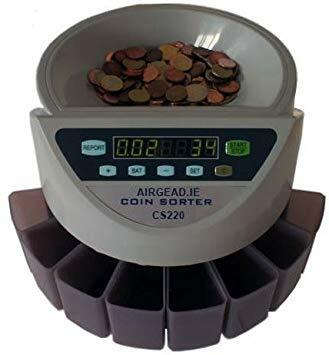 The CS-250 is a robust and simple to use coin counting and sorting machine. It operates at up to 220 coins per minute with a hopper capacity of 350 – 400 coins. Sorting and counting continues uninterrupted even as the hopper is being topped up. Thanks to its Pause/Resume function, the machine will stop when a coin drawer is full, allowing the drawer to be emptied. The counting and sorting will then resume at the push of a button. This machine also incorporates a batch function, which pauses the machine once a certain count is reached. This is ideal for sorting coins into bags; simply set the machine to stop once it has reached the correct number of coins to fill the bag.